1. There are 200 questions on a 3 hour examination. Among 200 questions, 50 are Science. He spent twice, as much time on each Mathematics questions as for each other question. How many minutes did he spend on Mathematics questions? 4. Which of the following numbers does not fit into the series? 5. What will be the remainder when 19100 is divided by 20? 9. A woman sells to the first customer half her stock of apples and half an apple, to the second customer half an apple and half of her remaining stock and so also to a third and to a fourth customer. She finds that she has now 15 apples left. How many had she at first? 12. A and B each working alone can do a work in 15 days and 25 days respectively. They started the work together, but B left after some time and A finished the remaining work in 7 days. After how many days from the start did B leave? 14. A can complete a work in 20 days and B 30 days. A worked alone for 4 days and the B completed the remaining work along with C in 18 days. In how many days can working alone complete the work? 19. The average of the test scores of a class of ‘m’ students is 70 and that of ‘n’ students is 91. When the scores of both the classes are combined, the average is 80. What is n/m? 23. A and B undertake to do a piece of work for Rs. 2,200. A alone can do it in 8 days, while B can do it in 6 days. With the help of C, they complete it in 3 days. Find C’s share. 24. By selling an article at 80% of it marked price, a trader makes a loss of 10%. What will be the profit percentage if he sells it at 95% of its marked price? 26. What is the maximum percentage discount (approximately) that a merchant can offer on his marked price so that he ends up selling at no profit or loss, if he initially marked his goods up by 40%? 27. A shopkeeper marks the prices at 15% higher than the original price. Due to increase in demand, he further increase the price by 10%. How much percentage profit will he get? 28. From a vessel containing 100 l of wine, 10 l are drawn out and an equal amount of water is added. From the mixture, 10 l is again drawn out and same quantity of water is added. What is the final ratio of wine and water? 29. From each of two given numbers, half the smaller number is subtracted. After such subtraction, the larger number is 4 times as large as the smaller number. What is the ratio of the numbers? 30. Men, women and children are employed to do a work in the proportion of 3 : 2 : 1 and their wages as 5 : 3 :2. When 90 men are employed, total daily wages of all amounts to Rs. 10,350. Find the daily wage of a man. 37. A boat covers 12 km upstream in 3 hours, while it covers 36 km upstream and 24 km downstream in 6 1/2 hours. What is the speed of the current? 38. Average rainfall on Monday, Tuesday, Wednesday and Thursday is 420.5 cm and average on Tuesday, Wednesday, Thursday and Friday is 330.5 cm. If the ratio of rainfall for Monday and Friday is 20 : 21, find the rainfall in cm on Monday and Friday. 39. The average of 5 consecutive integers starting with ‘m’ is n. What is the average of 6 consecutive integers starting with (m + 2)? 45. Water flows at a rate of 10 meters per minute from a cylindrical pipe 5 mm in diameter. How long will it take to fill up a conical vessel whose diameter at the base is 40 cm and depth is 24 cm? 57. An amount is invested in a bank at compound rate of interest, after first and third year is Rs. 1200 and Rs. 1587 respectively. What is the rate of interest? 63. Find the value of a3 + b3 + c3 – 3abc when a = 225, b = 236, c = 227. The bar chart given below shows the percentage distribution of the production of various models of a mobile manufacturing company in 2007 and 2008. The total production in 2007 was 35 lakh mobile phones and in 2008 the production was 44 lakh. Study the chart and answer questions 96 – 100. 96. 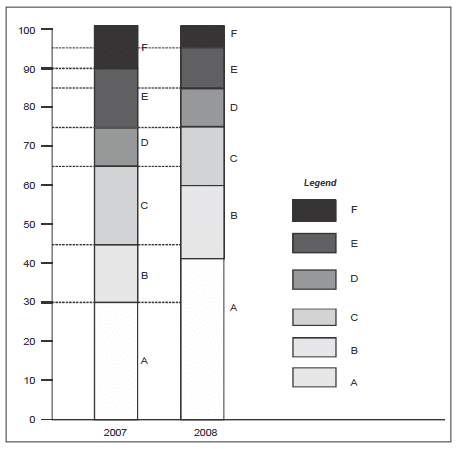 What was the difference in the number of B type mobile produced in 2007 and 2008? 98. If 85% of the D type mobile produced in each year were sold by the company, how many D type mobiles remained unsold? 100. For which models was the percentage variation in production from 2007 to 2008 the maximum?